At the very end of Mount View Road at the northern point of Portsmouth is a public right way, marked with a sign, that leads to Common Fence Point. The narrow dirt path starts by a white fence at the last house on the right. The path winds through tall grass and shrubs before coming to the high tide line. Just to the left is a rock outcrop at the point that is accessible at low tide. From here you can see almost all of Mount Hope Bay including the three bridges (Mount Hope, Sakonnet River, and Braga). The rocky beach below the high water mark makes for a nice additional beach walk. Distance will vary on how far of a beach walk you do take. Common Fence Point is a small knit residential community. Please do respect private property. Rocky Beach and the Mount Hope Bridge from the Point. Hot summer day… check, very short walk… check, by the water… check. Compass Rose Beach is a very small beach at Quonset Point facing south towards the West Passage. It is just west of the Martha’s Vineyard Ferry Terminal at the end of Roger Williams Way. Though small and in an industrial area, the beach is very clean with views of the North Kingstown shoreline, Jamestown, and the Jamestown Bridge. On the tenth anniversary of the September 11th terrorist attacks, the new bridge spanning the Taunton River between Fall River and Somerset was dedicated to area veterans. 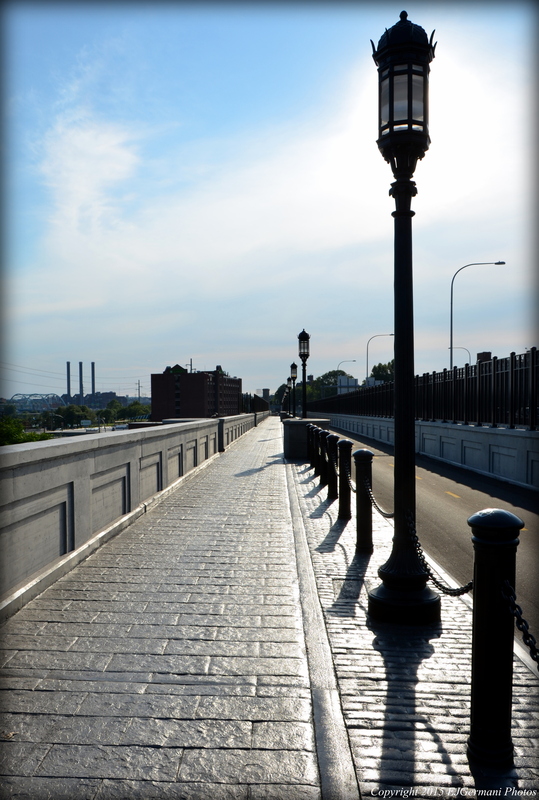 The bike path that is on the north side of the bridge was then dedicated to Pvt. Michael E. Bouthot, a young resident of Fall River, who died in 2006 in the war in Iraq. The bridge and bike path officially opened a month later. The bike path in its entirety is just under a mile long starting at the intersection of Grand Army Highway and Brayton Avenue in Somerset. It then heads downhill to Riverside Avenue where there is a memorial to Pvt. Bouthot. The path then crosses the Taunton River on the bascule drawbridge. From the bridge you can see a power plant just north of Breed Cove and several miles beyond it. To the south you can see the old Brightman Street Bridge, Braga Bridge, Battleship Cove, Brayton Point, the Borden Flats Lighthouse, and the Mount Hope Bridge. After crossing the bridge the path curves around and under the bridge before concluding at Wellington Street in Fall River. This hike in North Kingstown is tucked away on former military property out on Quonset Point. The hike offers quite a bit in both variety and views. A pair of binoculars is a must for this hike. Also, before embarking on this hike, you should check the tides. The beach portion of the hike will be nearly impossible and impassable during high tide. Starting from a parking lot at the end of Marine Road, we went to the eastern entrance to the bike path. The western entrance is the Quonset Bike Path that leads to Post Road. At the entrance is an informational board with a map. For the next 1.3 miles we followed the paved bike path to its terminus at Narragansett Bay. The bike path passes Allens Cove along the way. At the end of the bike path is Calf Pasture Beach. It is quite possibly one of the best kept secrets in the state as far as beaches. It is a long, clean strand with sweeping views of Narragansett Bay. To the north you can see the Warwick Neck lighthouse. To the northeast, you can see Barrington Beach and Rumstick Point nearly eight miles away. Even further, you can see the massive cooling towers in Somerset, Massachusetts, which are about thirteen miles away. To the east and southeast you can see almost all of the major islands of the bay including Patience, Prudence, Hope, Aquidnick, and Conanicut. Also visible from the beach are all three of the major Rhode Island bridges (Mount Hope to the east, Newport and Jamestown to the south). For the next mile we followed the beach south to the point where Allens Cove meets the bay. After traversing the point we soon found a rocky access road. The road soon starts to cut through the interior of the point. We first passed several shrubs before entering a pine grove. There are several spur trails to the right the meander around the property. Also, keep an eye out for a swing on the left. At the time of this hike it was safe for use. (Yes, it was tested!!) We followed the main trail to its end at the bike path, then followed the bike path back to the parking area. There are no blazed trails on the property. The first Washington Bridge was built over the Seekonk River in 1793. It was a covered drawbridge that connected Fox Point in Providence to Watchemoket Square in what is now East Providence. Since then several replacement spans were built along this stretch of the river. Today, you can walk across the Seekonk River on a section of the original 1930’s bridge that has been preserved. There are some informative boards near the center of the bridge explaining the history of the bridge and the surrounding area. The rest of the Washington Bridge that carries Interstate 195 over the river has been reconstructed. The linear park is made up of a bike path (part of the East Bay Bike Path) and a walking area with several park benches. The view to the south is the lower Seekonk River at India Point and Bold Point where it flows into the Providence River. The walk from India Point Park to Watchemoket Square is about six tenths of a mile. Longer distances can be added to this walk by adding India Point Park or continuing along the East Bay Bike Path. Looking Towards Providence Along The Linear Park.